Arguably, this question is a classic time waster and the student who poses it should be told to just get on with writing up their research. But as someone who edits theses for a living, I think a bit of time spent on fonts is part of the process of buffing and polishing what is, after all, one of the most important documents you will ever produce. Just bear in mind that there is no need to immerse yourself so deeply in the topic that you start quibbling about whether it’s a font or a typeface that you are choosing. 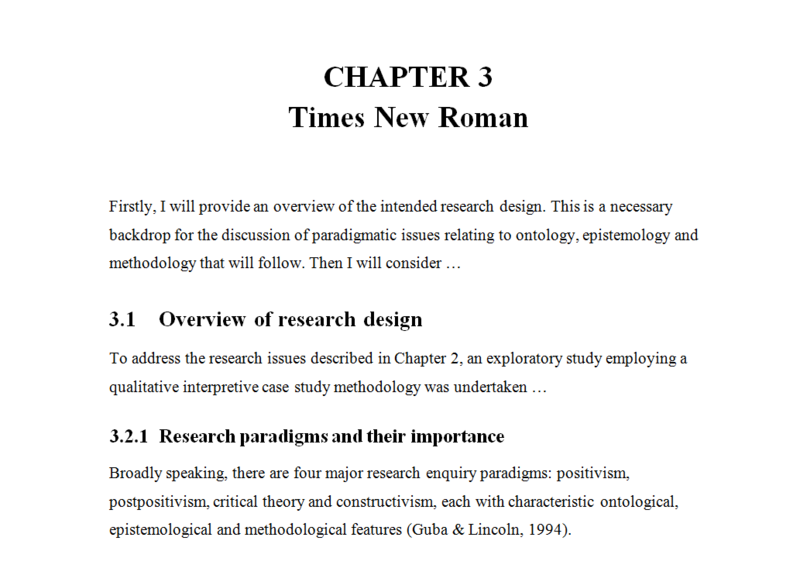 Times New Roman is the standard choice for academic documents, and the thesis preparation guidelines of some universities stipulate its use. For many years, it was the default body text for Microsoft Word. With the release of Office 2007, the default became a sans serif typeface called Calibri. Lacking the little projecting bits (serifs) at the end of characters makes Calibri and its many friends, such as Arial, Helvetica and Verdana, look smoother and clearer on a screen, but generally makes them less readable than a serif typeface when used for printed text. The other problem with choosing a sans serif for your body text is that if you want passages in italics (for example, lengthy participant quotes) often this will be displayed as slanted letters, rather than as a true italic font. You would like your examiners to feel as comfortable as possible while their eyes are traversing the many, many pages of your thesis, so maximising legibility and readability is a good idea. Times New Roman is ubiquitous and familiar, which means it is probably the safest option, but it does have a couple of drawbacks. Originally designed for The Times in London, its characters are slightly narrowed, so that more of them can be squished into a newspaper column. Secondly, some people intensely dislike TNR because they think it has been overused, and regard it as the font you choose when you are not choosing a font. If you do have the luxury of choice (your university doesn’t insist you use Times New Roman, and you have defined document styles that are easy to modify, and there’s enough time left before the submission deadline) then I think it is worth considering what other typefaces might work well with your thesis. I’m not a typographical expert, but I have the following suggestions. Don’t use Calibri, or any other sans serif font, for your body text, though it is fine for headings. Most people agree that dense chunks of printed text are easier to read if the font is serif, and examiners are likely to expect a typeface that doesn’t stray too far from the standard. To my eye, Calibri looks a little too casual for the body of a thesis. Typefaces like Garamond, Palatino, Century Schoolbook, Georgia, Minion Pro, Cambria and Constantia are all perfectly acceptable, and they come with Microsoft Word. However, some of them (Georgia and Constantia, for example) feature non-lining numerals, which means that instead of all sitting neatly on the base line, some will stand higher or lower than others, just like letters do. This looks nice when they are integrated with the text, but it is probably not what you want for a tabular display. Consider using a different typeface for your headings. It will make them more prominent, which enhances overall readability because the eye scanning the pages can quickly take in the hierarchy of ideas. The easiest way to get a good contrast with your serif body text is to have sans serif headings. Popular combinations are Garamond/Helvetica; Minion Pro/Myriad Pro; Times New Roman/Arial Narrow. But don’t create a dog’s breakfast by having more than two typefaces in your thesis – use point sizes, bold and italics for variety. By default, Constantia has non-lining numerals, but from Word 2010 onwards you can set them to be lining via the advanced font/number forms option, either throughout your document or in specific sections, such as within tables. Here is an excerpt from a thesis, shown twice with different typefaces. The first excerpt features Calibri headings with Constantia body text, and the second has that old favourite, Times New Roman. As these examples have been rendered as screenshots, you will get a better idea of how the fonts actually look if you try them on your own computer and printer. This entry was posted in Miscellany, On Writing and tagged editing, fonts. Bookmark the permalink. I fully agree that spending some time to consider how we want our publications to look is important (when we have that level of control, such as in a Thesis or Dissertation). Attractive layout and easy-to-read print will help the Reader engage with the text. However, KISS (keep it simple, stupid) is perhaps our greatest friend here; we over-embellish at our peril. Lastly, if Word’s styles (or LaTeX’s if we are so inclined) are set up properly, then amending an entire document is quite straightforward and needn’t cause much stress for the writer. Oh, and I agree in relation to setting up of styles. Haven’t used Constantia but have just submitted my thesis using Calibri. I certainly don’t see it as too casual. That would be Comic Sans or similar. I see it as peaceful and calm. I wonder whether the font affects assessors unduly? If so, is there a difference in impact linked with academic discipline. Thanks for these great suggestions. Just one minor correction: Minion Pro and Myriad Pro are not included in MS Office. They are bundled with Adobe software. Thanks, yes, you are right. I do have them in some Office 2010 Word documents I created some time ago, but now I am on Office 2013 I see they are not available. Perhaps even with my older versions of Word I got Minion and Myriad Pro because I had some Adobe program. Times New Roman has a complete range for mathematical symbols and is best for studies containing mathematical equations. Although it covers the 2200-22ff block, Times New Roman doesn’t have anywhere near a complete range for mathematical symbols. In particular, it comes up very short for arrow symbols. Some fonts don’t have the required character sets (or at least, there are only cut-down versions of those sets included in MSOffice) and so not all the diacritics are available. My university’s template is based on Garamond for body text but I have changed to Palatino in order to write one (prominent) author’s name correctly with a diacritic over the Z. The alternative was to have every instance of the author’s name in TNR in the middle of Garamond text (no way! ), or to omit the diacritic, which is effectively spelling it incorrectly. Reblogged this on Janene Carey. I am considering Sitka Heading or Sitka Subheading. Does anyone have any views on these fonts? Certainly in people with language or visual problems, sans serif have been shown to be more readable in a couple of small studies (http://dx.doi.org/10.1111/1460-6984.12206, https://www.islandscholar.ca/fedora/repository/ir%3A13069). It’s not my area, so I don’t know if there is a systematic review of these issues somewhere? Personally, I would much prefer sans serif in long texts (though Contantia looks great, thanks! ), but this demonstrates the subjectiveness of the matter. Certainly in people with language or visual problems, sans serif have been shown to be more readable in a couple of small studies. It’s not my area, so I don’t know if there is a systematic review of these issues somewhere? Thanks for this post, Janene. I think every PhD student goes through the font-procrastination phase, but for me this was an important moment of – as you say – polishing, and also of valuing the look and feel of my thesis document. I wrote about my font choice of Garamond here – https://theeduflaneuse.wordpress.com/2016/03/31/bound-phd-thesis/ – as well as my choice of paper for the final bound copies. For me Garamond was a more beautiful serif option than the ubiquitous and squishy TNR. It also made sense for the narrative approach of my thesis, as it was reminiscent of storybooks. Thank you, Janene. I don’t expect everyone would be as book- and font- obsessed as me, but it helped me connect with my text and feel ownership over the look and feel of the final product. “7.2 Formatting should be: line spacing 1.5, Times New Roman or Arial 12 pt font, all four margins 20mm, A4 size. In that case, I’d choose TNR. I’d hope the binding margin could be more than 2 cm, though. There is some good advice here, but also a few prejudices receiving confirmation. To begin with, “Most people agree that dense chunks of printed text are easier to read if the font is serif”. No one has been able to demonstrate a definitive relation between reading speeds and serifs – in general. In principle it is an aesthetic question, but of course we don’t approach this question unbiased. My private theory is that the omnipresence of sans serif body texts in many (dull) academic textbooks, has prejudiced us against their use. It isn’t that serifs are easier to read, it’s just that we approach sans serif texts from a more negative angle to begin with. One needs to be practical, however. Most academics in my experience have a conservative attitude to type (this post is a good example), so why irritate them by setting your thesis in Comic Sans? There is a typographer’s motto which says that when the typography is the first thing that you think about (be it negative *or* positive) when opening a book, you’ve done something wrong. It should support the text, be subservient to it, not jump out. Because when reading texts, type is far less important than *typography*, and the choice for serif or sans serif in general is less important than the choice for a *good* serif or sans serif font. Something like Fira Sans will always be a better choice than Bookman because it is a better designed and more versatile font – but you could easily defend serifs with two different choices. Also, adapt your layout (if you have that option) to the type you’ve chosen. If you insist on using Bookman, make sure to use enough whitespace so it doesn’t end up as a nightmare of mingling strokes. But most importantly: suit your typeface to the task it is supposed to perform. Constantia is a fine choice in principle, but not so much if you have a lot of alternating italic and regular text, because the contrast between regular and italic is insufficient in that case. And it’s OK to alternate serifs for headers and sans serif for text, so long as your text contains longish passages of body text. If you have a new header (or several) on each page, you may want to used variations (Bold, caps, etc.) of the same typeface throughout your text to bring some peace to the page. I used Segoe UI because of its good legibility on screen and in print. Has anyone else used it? Note that you used a sans serif font for this post 🙂 Please explain. This is not my website and I do not have any control over the font used here. It is probably whatever came with the particular WordPress theme Inger chose when she first began the Thesis Whisperer site. Furthermore, the post is on a website, not on a printed page. San serif is very commonly used for text display on screens due to the fact that screens have much lower resolution than print. Lower resolution means the little serifs are less clear, making the font less legible. Had hoped for humourous response. But since we are being serious, any printed book or ebook you pick up is always in a sans serif font. As far as legibility is concerned, in the days before typewritten school/ uni assignments were submitted in handwriting, I was always instructed to submit in printed form, ergo, sans serif, not in ‘running writing’. The font question needs to be resolved by the examining institutions whom should stipulate their preferred font and negate this confusion for students. yep, I take full responsibility for the fonts here! Thanks for this article – the timing is perfect for me as I am writing my 5th chapter and realised too late that I should have had a set template before I started writing! I like the suggestion re Constantia and have just started using it, including adjusting the numerals to be lining (thank you Google). I am now cobbling together my style template but would really welcome suggestions for a MS Word template for a humanities PhD thesis that actually looks clean and has all the functionality needed. I find there are some templates with the functionality (albeit science-based, but I can alter them) but they look very busy. Grateful for some advice. If you’ve already started cobbling, I would go with what you have. You can keep it quite simple, just defining Heading 1, 2, 3 and maybe 4, a paragraph style, a style for indented quotes, a reference style. If you are comfortable with section breaks, headers and footers, setting up the front matter with the page numbers appearing correctly is not difficult. Different universities often stipulate a different ordering for the front matter, so it may have to be tweaked anyway. The Table of Contents and Lists of Figures and Tables can all be automatically generated by Word. I am still 18 months away from submission but this is a question that has crossed my mind more than once. I am glad to realise I am not the only one who spends time deliberating these things and whilst to some extent it can be seen as procrastination it is important to remember that examiners are only human and whatever I can do to make the reading of my thesis more enjoyable surely has to be a good thing right? I think that’s the thesis of my original post! Thank you for the great information on dissertation fonts. At least I am now knowledgeable due to information provided in this article. We provide dissertation writing help at http://www.cutewriters.com/finest-quality-phd-dissertation-writing-service-uk-usa/. I prefer using Times New Roman and font size 12 for all academic papers. Reblogged this on The Ramblings of a Trainee Egyptologist. I struck a new and unexpected problem late yesterday when converting my thesis Word document into a PDF – font rendering in PDFs. For context, my uni requires thesis to be uploaded as PDFs, they are not printed and bound. My thesis was in Word, and used Times New Roman font. However any text in bold & italics rendered very differently depending on how I created the PDF, i.e. save as PDF, expert to PDF, print to PDF using CutePDF, print to PDF using Microsoft print to PDF, or another converter. A related problems is that fonts are not embedded in PDFs, they are embedded in the pdf reader. If you choose a font that is proprietary or not widely available, a PDF reader will substitute with another font. So you beautifully prepared thesis may not look the same depending on the PDF reader!! I think that to avoid this problem, you should embed the fonts used in your document first. Within Word, choose File/Options/Save and tick ‘Embed Fonts in the File’. Alternatively, when you do Save As in Word 2013 there is a Tools button next to the Save button that lets you access the same menu. This makes your document’s file size much larger but it is a good thing to do just before creating your PDF. Also when you Export to PDF, tick the PDF/A compliance box because that embeds the fonts in the PDF. Thank for this great post! I was wondering if you could advise me please. I have written up my thesis in Calibri and I’m now hoping to change the font of the main text. I however cannot change the font of diagrams and tables, as there are quite a few and I’ve already formatted them to fit. So I was wondering, would it be OK if my main text was say in Garamond and the headings, tables and figures were in Calibri? I actually like Calibri in tables. I think it looks crisp and clean and you can set it at a slightly smaller size than the main text (11 or 10 pt) and it remains legible. I am about to finish my thesis and my font is Cambria for both heading and body with size 12. I have to submit a hard copy so do you think it would look good ? I use Cambria. It’s smooth and stylish without sticking out. And it fits neatly with math symbols and formulas. Thank you for this – really helpful. I’m going with Constantia for main text. I thought I would go with Arial for headings: bold anf larger in main headings and italic in subheadings. But as someone who saw my draft pointed out the subheadings don’t look so good because Arial doesn’t have a real italic but an oblique. What’s your opinion on this? I’ve been looking for a sans serif with real italics. Calibri has it but I’m not cracy about Calibri. Helvetica is the premium font that Arial pretends to be – it has true bold and italics. It’s a paid font, but unofficial free versions can be found on the web. Also check out Lato at Google fonts – it has a plethora of weights and styles that you can use. Roboto may also be option, also on Google fonts. Good on you for sourcing out a real italic! Most people aren’t aware that there is such a thing. I am joining this conversation a little late, but I am a believer that for academic work to be noticed, or read, among thousands of other articles, it has to look good. That point aside, a well-formatted document with a good serif font looks more authoritative and should be a default for academic documents. Many times over, I put off reading papers or theses that are relevant to my research because they look over-crowded (cough TNR), and figures are unprofessional or messy. Now an examiner is obligated to read a thesis, but you should do what you can to entice them to start reading sooner. But ultimately, do it for you. It’s your PhD thesis, most likely the only one you’d have! Take inspiration the most reputable journals (nature, The New Yorker online) for what fonts to use and how to mix them (if you so wish). Disclaimer: it seems obvious but I do not suggest you spend time on this if you must adhere to fonts/templates of universities/journals. When formatting a document I like to think of the reader, and what I personally like to see as a one. Bright pages, clearly formatted text and figures, and a general harmony in the document. You can achieve all of these objectives with the right font (check the examples provided here, you will hopefully agree that constantia gives the page a `brighter’ look). I won’t bore you with my preferences of course, but for those looking for some guidance on typography and typefaces only need to type these words into their search engine. I would make some recommendations, however: check out google fonts, some of them are very good, and very widely used even if you don’t realise it. My favourite calibri alternative is lato, which is a great all rounder – for both text and headings. Fontsgeek also has typefaces perfect for books, such as Garamond and Baskerville. Finally, a personal plea: try out something like latex for your thesis. And if the text editor/compiler scares you, Lyx offers all the benefits of latex with a Microsoft Word-like user interface. however this post is truly a nice post, keep it up.